We have had a lot of fun hunting with Teddy. It is SO much fun to watch him!! It is hard to believe that in March he will be a year old already. He is such a cuddle bug, he is definitely unaware that lap dogs are usually a good bit smaller than him!! Take care and stay warm! Annie’s first bird! We couldn't be any happier with her, so thank you so much! Millie has really figured it out and is doing incredible! Has pointed woodcock and grouse. We love her so! Just wanted to update you on Moxie. It’s her first hunting season and she’s doing great. She has also proven to be a great family pet, and stolen our hearts. Wanted to say thanks for providing us with such a great dog! To oversell this dog is absolutely impossible. He is a celebrity everywhere he goes: children literally run down the street and yell and wave at him when he's in the back seat of my car and looking out the window. Countless people have stopped me while walking on him to say what a marvelous, handsome dog he is. His behavior and demeanor and attitude could not be finer. He loves life; he loves engaging in his surroundings; he loves people; he loves other dogs. And he loves all the small game in and around these parts. I haven't hunted in nearly a decade, and I didn't have any designs to start up again when TJ entered my life, but watching this guy's natural instincts come to the forefront, I might have to rethink that whole deal. He points rabbits and squirrels daily...freezing like a statue, following them with his nose, tail rigid, forepaw curled...it's a sight to behold, and it's a joy to watch him do what he was bred to do...naturally. Zero coaching whatsoever. Also, and much to my surprise given what I knew of the breed beforehand, he's turned out to be quite the water dog. We have a summer cottage on Newfound Lake in Bristol, NH, and I cannot keep him out of the water. He would gladly spend entire days swimming (and chasing after ducks) in Newfound Lake or in Newfound River...sometimes I think he thinks he's a labrador retriever. My very best wishes to you, and thank you so much for TJ. You are a remarkable breeder and your dogs are top notch. George...Phoebe has been a terrific dog for us: a very active member of the family who can "turn it off" inside the house provided she has had her exercise, eager to wrestle with the boys but able to tone it down for the younger cousins, always up for run in the woods regardless of the weather and very tolerant of other dogs as well as our cat. Although she doesn't like to swim, she never met a mud puddle that she didn't like. I did hunt with her the first fall we had her, but after a Lyme scare last year I've mostly been sticking to the trails. She does have a very good nose, even putting up a very early woodcock in early March despite the fact that we still had almost a foot of snow on the ground. Please enjoy the attached pictures. George, Just wanted to drop a line and say merry Christmas and I hope everyone is doing well. Blue is an incredible dog. He is so well behaved in the house and the kids have a blast with him. I think he got winnies' loving side. This was the first year in the woods also and he did great. He was easy to train, stays close and listens to commands and whistles - couldn't ask for more. Here are a few pictures for you to see how he's grown up. Bryant A. MA and family. Hi George and family.. Well it's been a whole year since we got Belle from you...and it's been a good one. The first thing I noticed was that she immediately began to whine at the door to go outside and do her business wow! ( two months old ) she is a very smart dog from learning her name to knowing what she could chew and what not to touch. Belle was the most timid pup of the bunch which worried me at first ( now I know that this dog could be trained to hunt elephants if you wanted). Anytime she was scared she would just move to my leg and look up at me, with a little reassurance..she would get over a fear after three encounters she seemed to be over it. The one thing I would do with the next pup is I would keep it closer in the woods from the beginning....I let Belle run free...and now I have to keep on her to stay close in the thicker stuff. Any mistakes that I have made have been easily fixed. She seems to learn after about three lessons and then being consistent after that. I started teaching "heal" about two weeks before bird season opened.... no problem she picked it right up just like every other command I've ever asked her to learn. I used bubble wrap to get her used to gunfire....I went from that to a cap gun and then a starter pistol... if she reacted negatively to the noise I would put it away for a week and start again ( only twice did I have to restart). Now if she hears gunfire she snaps to attention and wants out of the truck. We started using a frozen grouse to drag around a field over the summer...she could never be fooled and scented the bird with no problem ( I even had someone Belle had never met do the dragging). This dog has had a wicked prey drive from the beginning from watching bird hunting videos to whining at a mount on my wall. I was able to release pheasants in Berlin while she waited in the car in Oct. that seemed to put her over the edge....we waited an hour and let her out down the road from the release site...she wild flushed a few and was a little awkward and jumpy at first but after a few times out i could she her behaviors change a knew she was on something. being staunch is something she needs work on but I have no worries that by next year she will be perfect. The funny thing is that she spent the summer living at a rafting camp and hunted chipmunks daily....she sees a chippy and she goes ridged....a pheasant and she shakes and barks ( working on it). but those thing are not a problem. Any mistakes that I have made in training have been easily corrected later. Being steady to wing and shot didn't seem important at first but I've changed my mind and have been working on it and shes getting it no problem. She is great with people and would wander the campground visiting people. She was very nervous of water..then one day I was looking for her and found her swimming in the river... after that she would pleasure swim everyday stalking water bugs,frogs. and fish. I never pushed her to do anything she didn't want to do...she would figure it out on her own. One of the jokes around camp was that I had gotten a self-training model and that she was the kind of dog that you fed everyday. One old guy up in Errol who had had two Llews in the past ( and missed them) after meeting Belle asked where I had gotten her and that it was time to move on and get a pup. She has impressed even the most hardened northerner. We met other hunters and dogs in the field and have embarrassed a few older short hairs and labs...returning to the truck tagged out on pheasants and with a few woodcock while the others had nothing. "how old did you say she was" or "where did you have her trained" were some comments we heard a lot. I'm no dog trainer but she seems to know what i want and has figured out the game pretty well. she is very loving with my kids and is well behaved in the house finding her own space and relaxing....put on a pair of boots or grab a shotgun and she's waiting at the door. The dog bonded with me and we have spent a great summer and hunting season together...I've never been so impressed with a dog before and I cant thank you and your family enough for her. As you can imagine our Sophie is an amazing pup we love her greatly and she has become a great addition to our home. She has settled into my routine extremely well, since I work from a home office she follows me into my office and just rotates between the couch or the chair or even the floor behind my desk chair and is mostly quiet and well behaved as I work. That being said she has so much energy when I’m not in my office that it’s a really good thing we have our acreage that we can go to on the weekends and just let her run, and run, and run. It’s uncanny that even at the land she seems to know when I need to get something done and lets me have at it, but when I sit down she won’t have that and it’s all about her lol then it’s throw the stick, throw the stick, throw the stick…. Robert G. Springfield MA” Sophie"
I was a bit nervous about taking Llewie out for pheasant this year, but he’s been doing a fantastic job. I worked a lot harder on training my previous dogs than I did with Llewie – he just seemed to get it naturally. He has pointed a Grouse that I shot; has pointed several woodcock, a few of which have been collected; and has pointed quite a few pheasant. Friday and yesterday, Dave Suitor and I hunted with Llewie and Merlin in Hill. Both dogs were all business and we limited on pheasant both days. I’m including a few photos from Friday. For a dog just 6 months old, Llewie is doing a fantastic job. 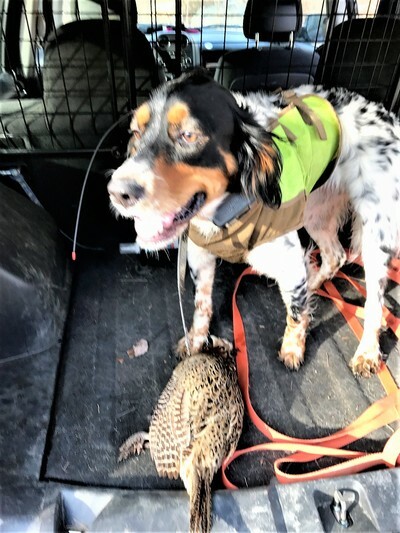 He is still learning and has several items that could still use improvement – hunting dead and retrieving are the main ones. Just wanted to send along a little something to show how much we are loving our Moxie from the Winnie/Milo litter in April. My dad has already contributed his latest article to our local sportsman's news, and it's all about what a great pup he is! I've attached the article for you guys to check out. We took him on vacation this week and we couldn't go more than five feet on a walk before someone stopped us to ask where we got such a handsome puppy, or inquire about his breed. We had a crowd of people around us one night as he pointed seabirds at dusk, amazed that such a little thing was so excited to hunt already. My husband is just itching to get him on birds at our local place, and from what I can tell, Moxie is feeling the same way! Thanks for a great experience, and even more importantly, a great hunting pup and addition to our family! *"BODE" He is so calm....and LOVES people! Thank you! She’s been pretty much the easiest dog I’ve ever had. Great in the House, great in the woods. Minimal training for anything I’ve tried to get her to do. Wow, I’ve been meaning to write to you for so long. Every time I think of writing to you about Piper I think of 5 more things to say about how wonderful she is. More on that below. It is with a heavy heart that I inform you that Ellie left me last weekend while out pheasant hunting in Nebraska. We were on our first walk of the day and Ellie was running out ahead of us and hunting as usual. Unbelievable that she was almost 15 years old and still going strong! We had just taken a water break and were hunting again and I commented to my old friend about how well Ellie was still hunting. A few minutes later we heard her moaning and ran over to see what was wrong. I held her head and she took 3 deep breaths and was gone. It happened so fast that I was in shock for several minutes. But it was such a beautiful scene out there in the middle of that huge CRP field and knowing that she had died doing what she loved and what she was bred to do made it seem so natural. It is exactly what I hoped and prayed would happen for her and for me. I am heartbroken but so grateful for all those years of having her as my best friend. I’ve been very fortunate to have work that allows me to be with the dogs most of the time and also to have the ability to take them hunting often. You would not believe how well Ellie has been doing these last 3 years. My friends were blown away by her stamina and longevity and so was I. She was almost never sick, honestly the only times I would take her to the vet were for minor hunting injuries. I have some amazing video of Ellie and Piper just two weeks ago that I’ll share with you soon. Ellie pointed a big covey of quail and Piper locked up on them too. It’s a beautiful sight to see those two friends on point on the GoPro video, and it turns out that it would be Ellie’s last. I don’t even know where to start about Piper. 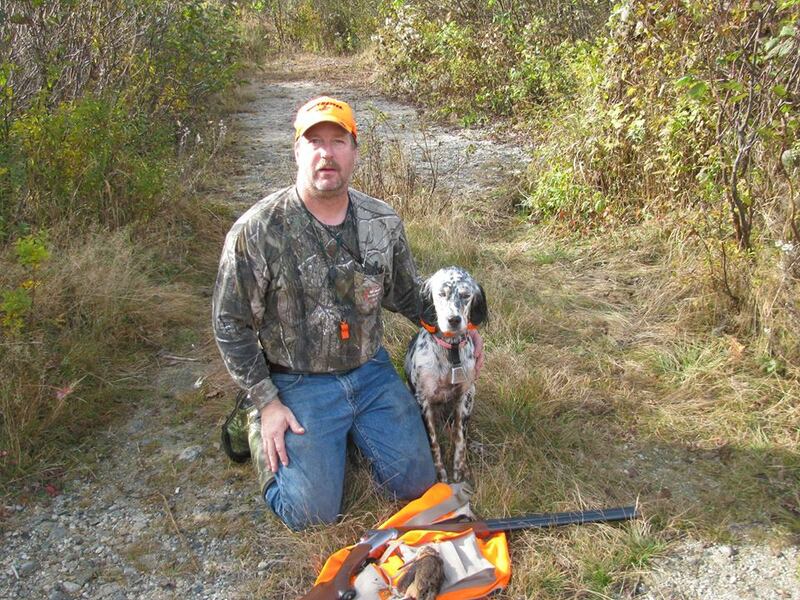 She is such a sweet, gentle dog and she is nothing short of amazing as a pointer on pheasants and quail. And she is such a wonderful pet, not a mean bone in her body. You have done a fantastic job George of breeding these setters! Thanks George, I will be forever grateful to you for breeding Miss Ellie. She was the best dog I ever had. Hope this email finds you and your family well. Just wanted to give you an update on our Holly, now 15 months old and 4 times in the field. She spent a month away from us in training back in August and had her first hunting experiences in November. Her first two times out were mixed, with some good points but also no inclination to retrieve - all to be expected given her youth and inexperience. However the last two times have been pure joy. The picture below was after her third time in a field, and the first time I took her out just by myself - she pointed and put up 4 birds and I was able to take 2. We walked fields of sorghum and corn for a solid 2 1/2 hours and she never took a break, showing great enthusiasm and willingness to range further ahead of me. This past weekend I went out with her and a friend and she was fantastic. We were in a field where a driven shoot had taken place earlier so a fair amount of leftover birds. Her nose is amazing - her points were strong and when she went rock solid, there was always a bird there, even if very well hidden! And while she won't retrieve yet, she does chase and keep an eye on the bird until I come and get it - hope with training this summer she can learn to retrieve as well. Again, she worked for near 3 hours without a break - her choice! I can tell that she truly loves being in the field. 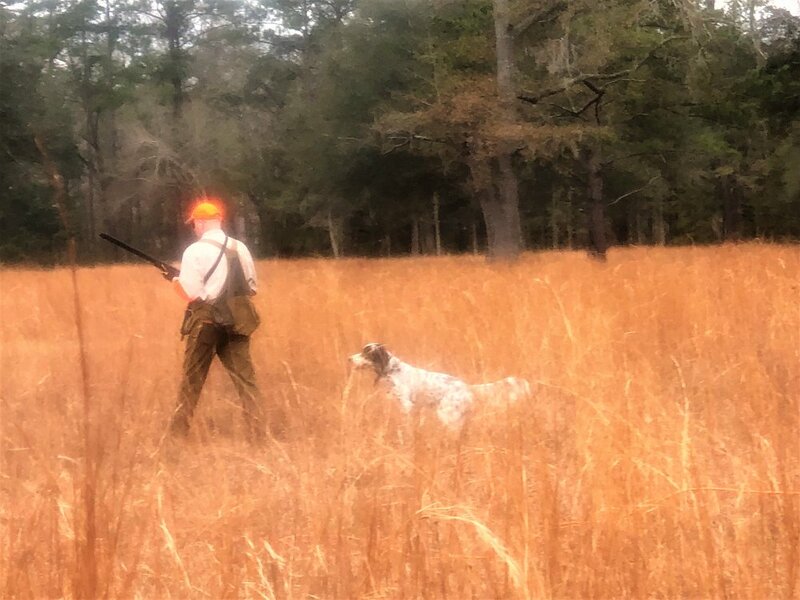 It's so much fun to hunt with my own dog - in this I'm as much a neophyte as she, and we're learning together - but I know she'll be a fantastic bird dog for years to come. And goes without saying but she's a lovely and friendly dog at home. My husband has always wanted a hunting dog. 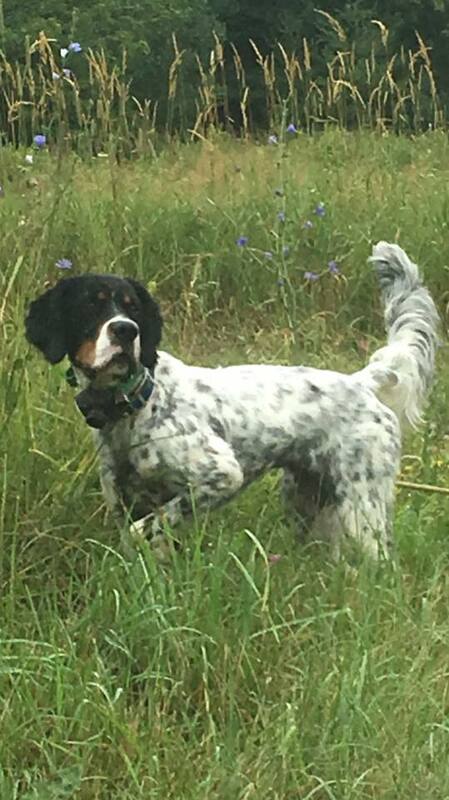 After years of telling me how much he liked the looks of the English Setter, he started his hunt for breeders in early 2013. Always the inquisitive one, thirsting for knowledge on the subject, he talked to several breeders and found LIttle River Kennels. Very happy with the openness and fund of knowledge George shared with him, the hours of research and phone calls, visiting the kennel and getting to see the dogs, we decided to get our first setter from Little River. We have not been disappointed. Knowing there were going to be two litters due within a week of each other in the Fall of 2013, we weren't sure which litter we were going to choose from, but when the first litter came, we went and picked our pup. Time couldn't pass fast enough to bring her home. Just before Christmas, we got to bring her home. I was a little nervous. Our 5 year old Golden Retriever was excited to have a playmate, until he realized she liked his ears, his cheek, his jowls... and it hurt. She still to this day reminds him who is boss, but is quick to curl up with him next to the woodstove. The second we put her on the ground, she was running. And she was fast! It wasn't long before I couldn't keep up with her. Each day as she grows older, she continues to amaze us. She loves to be outside. Ray takes her out in the woods for a run every weekend he is home. We watched her little self trying to climb over the fallen trees and whine for help. Now, she sails over trees like they aren't even there. He let her figure things out for herself, and she was a fast learner. She is all hunter when outside and, when inside, the perfect couch potato. One of her favorite activities is being in the kitchen, watching mom cook. 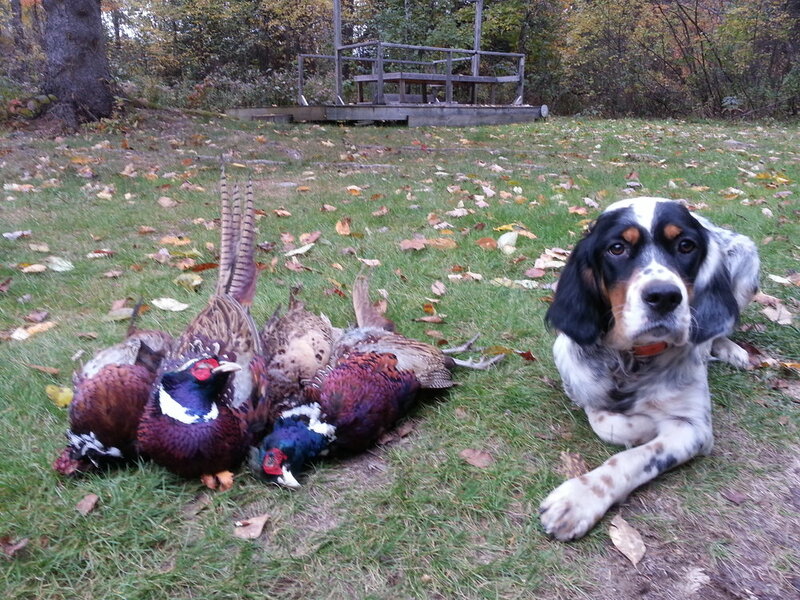 She is a loving family pet, but also foots the bill as a wonderful bird dog. Ray has spent much time with her and, this past fall, she pointed and put up at last 80 birds. This was only her first fall hunt. Other than teaching her the whistle, hand signals and telling her easy, she has done everything herself naturally. We are looking forward to the day when we are ready to return to LRK to choose another addition to the family. We have fallen in love with this beautiful bundle of energy, intelligence and beauty, wondering what took us so long to find the breed! Little River Kennel bred the most wonderful litter of puppies. Our Trigger, now six months old, is bright, healthy, happy, well adjusted, eager to please, and a joy to be around. 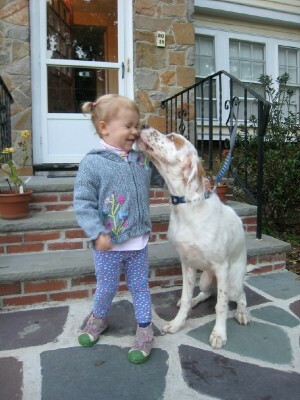 “Ellie has been the most fantastic dog I could have ever hoped for George! She is my best friend and an incredible hunter and house dog. She got to hunt pheasants this year for the first in South Dakota and CO and did great. At first there was so much scent that she went a little wild, because she had never been on pheasants before, but then she settled down. My buddy and I got 36 pheasants and 7 grouse! And Ellie was the star of the show – there were two German Shorthairs much younger and my friend had to rest and alternate them but Ellie went on every walk. And on quail she is the best, she has that game down pat. When I blow a quail call, she literally stops breathing waiting for them to call back so she can locate them! I hope everything is going well for you. I know it is time to get another pup soon so that Ellie can train her! 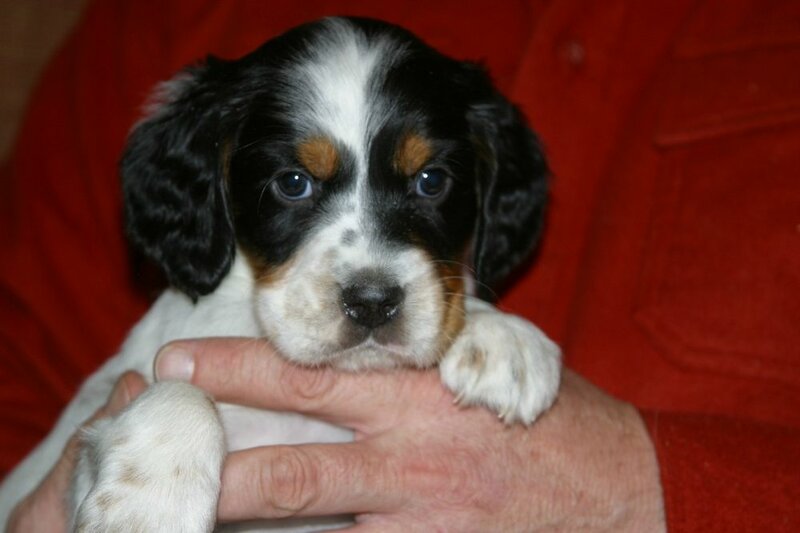 We had such a great experience when we came to you for our first Llewellin setter that we had to return to you for our newest member of the family. Zip was such a blast to hunt with there was no question in my mind that I wanted another one. As you can see from the attached pictures, our new pup Bode is coming along nicely. Hardly a pup now, he still acts like one and is very entertaining to have around. Though he has had his moments his early training has gone well. He is so soft mouthed that the six quail that I thought I would be replacing within a week lasted me into the fall. He works close, quartering within gun range in tight cover but will range out a bit as the area opens up. He seems to be more methodical than Zip who would plow head first into any type of thick cover, Bode picks his way through and canvas’s the area well. He had his first experience with a second hunter this past fall in Pittsburg and worked between us at a good range. Made me proud! He also holds point fairly well considering he has had no formal whoa training yet, using an experiential first year training method with more formal training to start next spring. We have a ways to go but all signs point to a real nice bird dog in the makings! What more can we say about Llewellin Setters from George Gubitose!!?? Since day one, talking with George about the upcoming litters was so informative. He was very patient with our numerous questions, since we were previous Springer owners and didn't know much about Setters. On May 9th, 2010, we picked up our 8 week old pup, Chyna. She was so beautiful and gentle. This was after visiting George and his family and dogs in Alton a number of times. George's youngest daughter, is a big help to her father. She actually picked a name that we loved for our pup, Chyna! She and her sisters and mother give lots of love and playtime to all the pups.until they are adopted. Chyna is 8 months old now. She easily and quickly was housebroken and progressed through her basic commands. The best is her staunch and ridged "Whoa" command! !No problems working through the various gun sounds. She took well to a few hours in the field this season and actually pointed and retrieved some woodcock. It is so amazing to see her work although sometimes she hunts for herself ,but we are working on that. We are retired and alone and she has been the best company, and just loves to play with the grand children when they visit. They love to hold her and chase with her in the yard. Sometimes she wears us out but we wouldnt want it any other way.We enjoy watching her constantly pointing songbirds and "chippies" in the yard.She has the perfect setter stance. She is a keeper. The dogs at Little River Kennel are beautiful, smart , hard working and very loving . We have loved every second of having Archie in our lives. He is an absolute joy. All our best, Spencer & Jamie G. MA. From the day Lori and I visited you and your family in Alton, we felt comfortable and welcomed by you all. 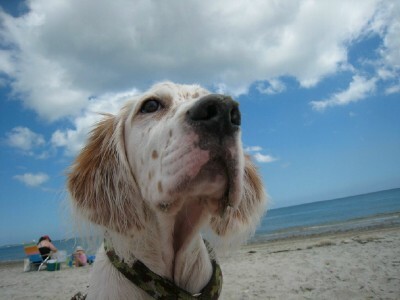 You gave us plenty of detailed information, educating us further about the English Setter breed and their characteristics. It was easy to see, as we approached the new litter of dogs you had, that they are a playful, endearing breed. Once we met our new little pup, Bailey, we knew we had been steered in the right direction. Bailey was not only smart and loveable, but she had a way of connecting with us that seemed magical. She loved to play (indoors and out), run, hide and cuddle. 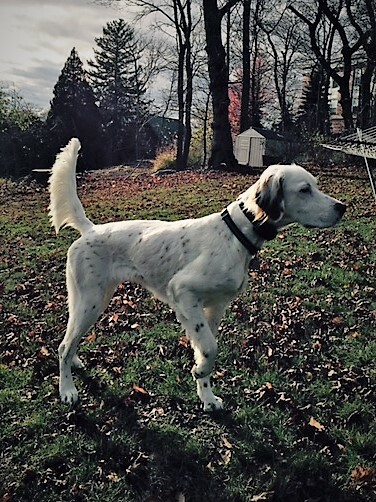 As she grew older, her natural hunting skills were easily enhanced by training and she became a great bird hunter as well as a beautiful pointer. She thoroughly enjoyed the outdoors and nature. It was incredible watching her run. Oppositely, we often enjoyed watching Bailey lie quietly on the cool shaded grass in our yard, while the wind blew her long hair around. Once our children came along, Bailey adapted to them with ease. She was calm and gentle and was the best family dog imaginable. She instinctively was a natural at protecting our girls and she was the first to let us know if someone was at the door. Bailey was the greatest gift to us and she became the center of our family. She won’t ever be duplicated but knowing first hand how wonderful her breed is, we are ready to welcome another “Little River Kennels” dog into our lives. Tucker is very sweet, a great pet and a terrific hunting partner. We are so happy with him, thank you very much. We are out hunting twice a week and have several birds already on our score card. (just a short story) last week we were hunting in the 4 inches of fresh snow and came home with three birds. We would of had four but someone missed a shot (me). I swear he turned around and looked at me as to say what was up with that....anyway thanks for staying in touch, love hearing from you folks..
George, Just wanted to let you know that this was Willy's first full year of "hunting", as my theory has always been to let them play and learn the first year out, let them learn and play the second year and hunt the third. It's a method that's served me well so far although I know there are a lot of people who'd disagree. As you know I guide some up here in Quebec and Willy's just a fantastic little dog. Hunts nice and close , extremely solid on his points and although he wasn't much for retrieving at first, he just "started" one day on his own and is really great at it now. And really, it took very little training. A little pigeon work, a little patience and that was about it. As much as he's a goof around the house and loves to just play, He's dead serious when he sees me getting ready to leave the house with a gun. And he "loves" the thick stuff which is a big change from my last "field" trial Setter. Attached is a picture of him on a pheasant this past fall. Thanks and keep in touch, feel free to use my name as a contact if you want." Hi, it is good to hear from you, I hope all is well. I have sent some pics for you to take a look at-- the white guy is Simon and the tri-color is Miss Beasley. Simon is going on 6 1/2 and Beaz is 2 1/2. I guess we can officially say that Simon is TRYING to slow down now--but-- Miss Beaz is not making it easy. They constantly play together and don't go anywhere without each other. It is hard not to spoil them. They think it's normal to sleep in our king size bed, have their own spots on the leather couch and go to daycare to play with their friends. It must be the breed, because I don't think we could get this lucky two out of two times. They have the best personalities and dispositions of any dogs we have ever owned. They love everyone, especially kids, and are exceptionally tolerant of the littlest ones who poke and pull things they shouldn't. I don't hunt-- but these are the best family dogs anyone could have. My wife and I will vouch for the breed and the breeders, Little River Kennels has helped us pick out two great furry family members. Thanks"
Hello! Just writing to let you know we could not be happier with our puppy "Coleman". Not only has he made a great family pet, my husband is very happy with his hunting abilities. Thank you very much for this wonderful addition to our family. Happy New Year to you all and thanks for sending out the new website. We will be forwarding it to friends who are looking for a puppy. We are now in our third year with Talisker and just grow fonder and fonder of this dog. The temperament, the intelligence, and the socialization he received from you all as a newborn all just make him so lovable-and on top of that, he has so much character! I've never known a dog to communicate the way Tali does. If you need any testimonials we would be happy to offer nothing but the highest praise. All our friends and family love him too! Hope you have a great new year with lots of little puppies to love! Both of the dogs that we have gotten from you have been excellent in the field and Morag has been perfect with the children. She even came and got me once when our daughter ran down our driveway (200 yards long) to find Mommy because she knew something was not right. One of my friends does a lot of field trialing and he has had the national grouse champion about eight years ago. He always seems to invite me to go hunting when he needs some good dog work. 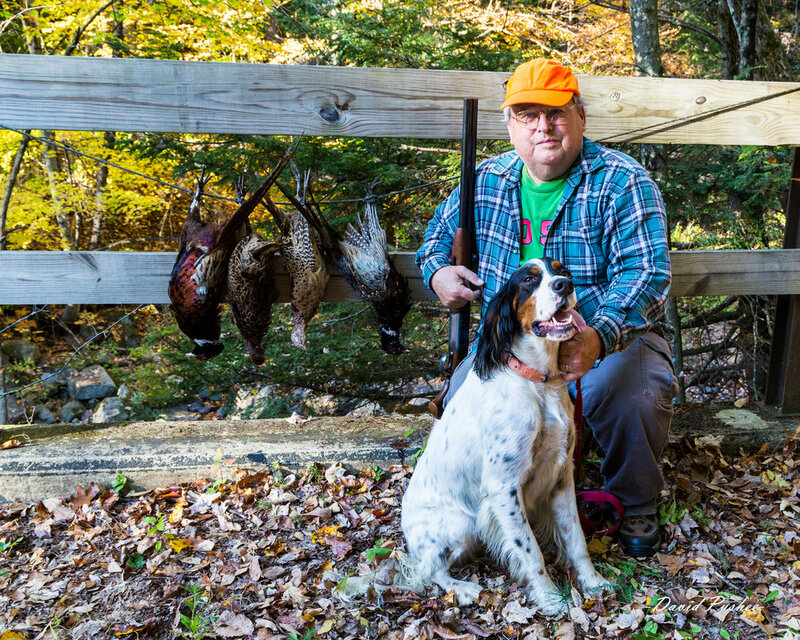 "My wife and I primarily hunt Partridge and woodcock in New England and could not be happier with our two Llewellin Setters! Both have terrific personalities, great hunting drive and wonderful confirmation. They could not have been easier to train due to their inherent abilities. Our male (5yo Atticus) is a grouse finding machine and our female (1yo Scout) was backing him naturally at 6 months! 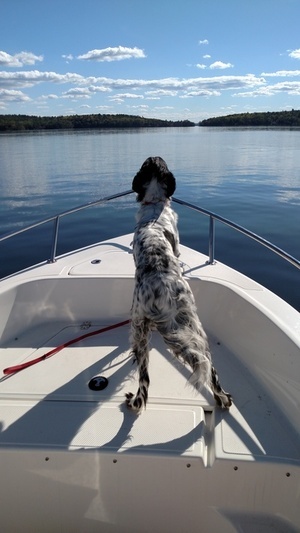 We could not have asked for a more stylish brace of Setters for the uplands and in the home." I think you might enjoy the experience Diana and I had at a recent training clinic with Atticus. Atticus really stood out physically from all the other dogs, which were predominantly German Short Hair and Wired Hair Pointers. Please, note the Pointer in their very name. Many agreed that Atticus was by far the most beautiful dog at the training site. They loved his silky hair, the tri-coloring, and the prominent feathering on his legs and tail. Well, these GSP people were enamored with his physical beauty but they KNEW he would not compete with their superior hunting dogs. I was nervous when I stepped forward with Atticus to do the live bird on-point testing. WOW, he excelled well beyond any other dog. I said hunt and he proceeded forward always zigzagging and always ahead in the proper fashion. He had to contend with 4 older bird trails and the new fresh trail and he never failed to locate and follow the correct scent trail. Everyone was awed by his pointing prowess. The expert marveled at how he would begin to signal a bird at 20 to 30 feet away and then go into and hold a CLASSIC point with leg raised, back-to-head level position, and tail wagging to indicate a found bird. He made me so proud that I was in tears heading back to the circle of dogs. I had joked, "Well, Atticus as the only Welsh dog, you're greatly out-numbered by your German counterparts." After his performance no one felt that a Llewellin Setter was somehow not at the level of other highly touted breeds. "We got Lady from George just over a year ago. She is my first bird dog and I trained her myself. She has been so easy to train and has been an amazing hunting partner. George even got her started on retrieving and she delivers birds to hand. My next dog will definitely be from Little River Kennels."